The capital it is and at the heart of it lays the ever gleaming, magnetic and buzzing Connaught Place. The place is an abode for array of offices and also a popular hub for foodies and shoppers in Delhi. Vatika Business Centres are almost permeating with their manifestation at 18 centres across the country and they scintillatingly have established themselves in all the prime locations. 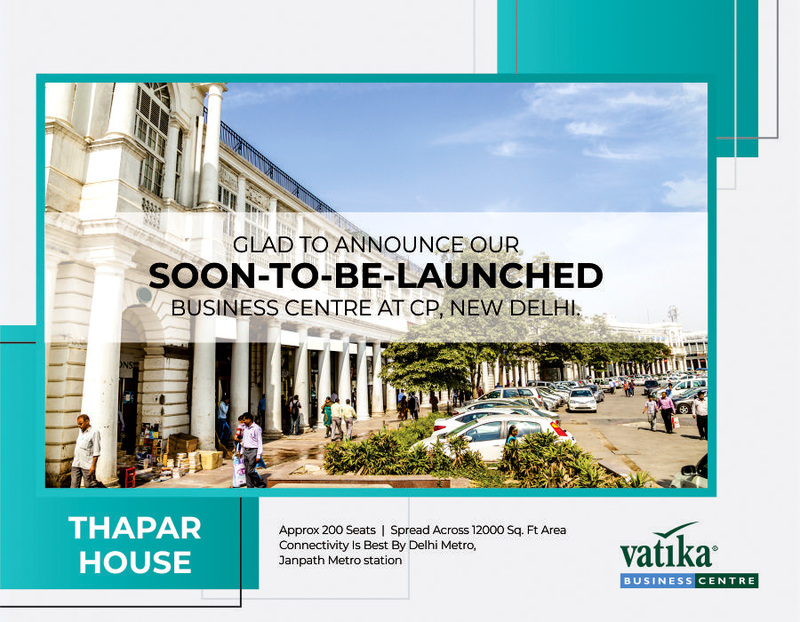 Vatika is expanding its chain of business centres by launching their second in Delhi, at Thapar House, Janpath. It has to undoubtedly be your office address if you are looking for a premium space for official purpose. The centre is going to inaugurate in September 2018 and is ringing high hopes to be hailed as warmly as its first centre was. Being at the core of Delhi, this co-working space has all the mandatory qualities as needed by your enterprise. Vatika business centres offer you premium serviced offices, virtual offices, co-working spaces and HD Conferencing meeting rooms. The centre also owns a beautiful cafeteria ‘Breathe’ where one could sit, sip over coffee and work clutter free for a lavish experience altogether. No second thoughts about it that you would be located at Central Delhi, the professional pivot where you sense a breeze of healthy work culture around. What are the plus points of hiring an office space like this one? You are just 50 metres away from Janpath Metro station, that means you are directly linked to the metro line and can commute anywhere to Delhi/NCR at any time during the day. You step out of the airport and directly reach Connaught circle via metro and that is where you find us. No running from North to South in search of an official address when you can now harbour yourself at Central Delhi. The plush side of having Thapar House as a work centre is that you are surrounded by the Capital’s best leisure spots- restaurants, book stores, lounges, art galleries, theatre etc. that promise you a rejuvenating life after work and a fun-filled weekend once you step out of your office. The office spaces are technically advanced and speak for themselves, these plug and play offices only need you and your team to come and resume working without any hassle of looking after IT support systems, staffing, legal compliance, tax-filing or concierge. You just name a Business support service and Vatika Business Centres have everything in place to be rendered to you as a great amenity. The idea is to provide all the premium services and make the experience lavish and rich. We offer all the facilities under one roof being the most cost effective with an uncompromising quality. The location of the office here at Thapar House could be a sagacious choice because this place is a business hub in itself and is exceedingly connected to the rest of the city. Our newly built centre is just a call away from you as we convivially offer you to reserve us at the earliest. Sonam Sehgal, a storyteller and blogger by passion believes in doing researched worked and writing insightful articles imparting knowledge of the topics relevant to entrepreneurship/startups/SME industry.